Citizen Science Day 2018 is just around the corner! Please note that the location has changed from the previous ones due to the limited availability of parking spots at the La Jolla Library. The North University Community Library has plentiful free parking, so please visit come if you're in the area! For the most up-to-date information about this event, visit SDCitSci.net. If you're not in San Diego, there is probably an exciting Citizen Science Day event happening near you! To find a Citizen Science Day Event near you, visit Scistarter.com. The March for Science is also happening on April 14th in San Diego. It starts at the Waterfront park at 10:00am and ends at 1:00pm (right before our event!). If you want to show your love for science consider joining the march! If you want to DO science, be sure to join a Citizen Science Day event near you (or contribute to Mark2Cure, of course!). Unfortunately, Mark2Cure no longer has a full time developer working on the project, so a lot of the issues and bugs that have been reported probably will not be fixed for a long, long time. We are very sorry for the frustration our system has caused our users and extremely grateful for the patience, graciousness, and encouragement our users have returned to us. Mark2Cure is really made up of a wonderful bunch of individuals, and we are thankful that this project has introduced us to you. Fortunately, many of you really put the science in the term citizen science and have systematically found ways to contribute productively in spite of all the issues in our system. You are all too amazing! NER module issues: The most frustrating one has been the inability to highlight certain words, and the random highlighting/un-highlighting of words when users try to mark something. This has been reported by many users (many, many thanks to those of you who took the time to report this issue). Fortunately, one of your fellow volunpeers has found a workaround that appears to be quite robust. To get around a lot of these highlighting issues, AJ_Eckhart highlights the entire paragraph to remove the preannotations. These preannotations seem to be an important factor in this problem, and he has tested this workaround for the 'cannot-highlight-a-specific-term' bug, the 'highlighting-a-term-un-highlights-something-else', and the 'highlighting-a-term-highlights' something else' bugs. RE module issues: A number of you have kindly taken the time to report issues with the RE module--the most common issue is the seemingly random inability to throw out an annotation. For this issue, two workarounds have been reported by our users. LadySteph has found that returning to the dashboard and then returning to the task will enable you to submit the response you wish (eg- throw out an annotation) and TAdams has reported that many of you have gravitated towards submitting 'Cannot be determined' in lieu of throwing out an annotation. We will take both workarounds into consideration when we analyze the data, so thank you all very much for contributing in spite of all these issues! Speaking of analyzing the data--we might not yet have enough abstracts annotated in order to generate ground-breaking, new hypotheses on NGLY1 deficiency, but we have enough for some initial analyses on the application of citizen science towards information extraction. We are working towards more scientific publications and look forward to sharing the results of your work and crediting you for your help. Note that many journal submission systems are not made to account for group names or a huge volume of names in the authorship; hence, we will continue to have our Mark2Cure contributors listed on a dedicated page which will be linked in the paper. As with our first paper, this will be an opt-in process because we respect your right to privacy. More details on opting-in will be sent via our mailing list. For the Monday April 2nd meeting our speaker will be Bonni Thoresen, speaking on “Mushrooms and Fungi of Southern California and Northern Baja”. The meeting will start at 6:30 PM in Room 101, Casa Del Prado in Balboa Park. We will take Bonni to dinner before the meeting around 5:00 at the Blue Water Seafood Grill. Come along to meet Bonni over dinner. Hopefully, you'll all forgive us for the delay in announcing the results of #CitSciMedBlitz. Our partners at EyesOnAlz, Cochrane crowd, and ourselves were a little tired after the blitz and we gave ourselves a short break. 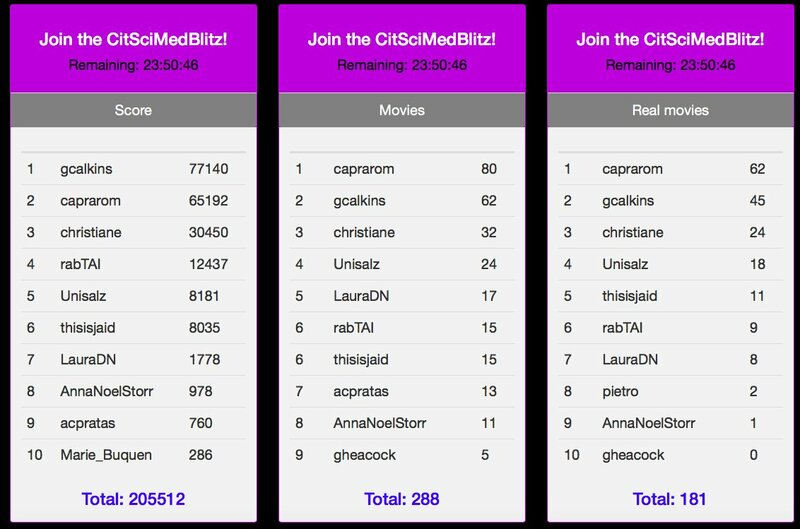 Since the blitz, the EyesOnAlz team has generated the #CitSciMedBlitz digital badge for participants of all three challenges and has been working on creating the trophies; meanwhile, the Cochrane crowd team has contacted the overall #CitSciMedBlitz event winners. We're all up and active now and looking forward to sharing a recap and the results of #CitSciMedBlitz with you. The first challenge, the StallCatchers challenge, was launched on February 26th at 7am PST. Within minutes of the launch, StallCatchers were hammering away at StallCatchers, including Cochrane Crowd's Anna. Anna managed to get on the leaderboard but wasn't able to stay on there for very long because the competition was just too tough. At least she placed, though-- I never even made it! By the end of the challenge, StallCatchers analyzed a whopping 18,348 real videos--the equivalent of two weeks worth of laboratory analysis! While the EyesOnAlz team was still cooling off from their intense challenge, we were gearing up for the Mark2Cure arm--and NOT without a huge set of worries. You can read more about the hiccups and snafu's that happened during the Mark2Cure 24hr challenge here. By the end of the challenge, CitSciMedBlitzers managed to submit ~300 doc annotations, and ~3000 relationship annotations--an impressive feat considering the increase in task difficulty, and the bugs and other technical issues that made the challenge--well, even more challenging! While we were busy analyzing the results of our challenge, Cochrane crowd was preparing the last challenge of CitSciMedBlitz. This challenge started off right with 50 assessments within the first 2 minutes, and over 5000 in just the first 4 hours! This arm of the challenge would determine which of the top contenders from the previous challenges would win the trophy so the competition was intense! By the end of this challenge, over 46,000 classifications would be made--allowing our teams to determine the overall winner of #CitSciMedBlitz. ...biomedical and health evidence research! Everyone who has contributed (in the past) and continues to contributes to these efforts deserve a round of applause for being generous enough to donate their time towards helping with disease and health research. The winner of the CitSciMedBlitz trophy is Michael Landau! Note, it was previously stated that Michael was also the top contributor to the EyesOnAlz challenge of CitSciMedBlitz. This is wrong. Mike Capraro was the top contributor across all three measures of the EyesOnAlz challenge and the overall top contributor of that challenge for CitSciMedBlitz. Editor's note #2: If you'd like to read more about CitSciMedBlitz from the EyesOnAlz team, check out their latest recap post here! The top contributor to the Mark2Cure arm of CitSciMedBlitz was Kien Pong Yap, while the top contributor to the Cochrane Crowd arm of CitSciMedBlitz was Nikolaos. The top contributors to each platform will be receiving a platform-specific trophy. Each platform will be awarding additional prizes to some of their top contributors and the notifications should be arriving via email (if they haven't already). Thank you all! Much respect for the work that you've done and the character you've shown! The results for Mark2Cure's arm of the CitSciBlitz are now available! Kien Pong Yap took the top spot in this challenge (see ranking at bottom of post). What's exciting is that several of these names were also in the top 10 for the StallCatchers challenge so it'll be a tough competition in the Cochrane challenge to see who actually wins the CitSciMedBlitz triple challenge trophy. The NER module was broken for the first few hours of the challenge, and we received emails and phone calls about it within the first hour of the challenge. THANK YOU for bringing it to our attention and providing so detailed information about the bugs. Max was able to solve it while on the airplane ride to San Diego for the Future of Genomic Medicine Conference. In spite of the NER module issues (a HUGE thanks to TAdams, JudyE, AJEckhart, and Itwontalwaysbelikethis for helping us troubleshoot), users doing this task still managed to climb the ranks even with the delayed start. A Mark2Curator created an introductory video about the relationship extraction task for the event while we were running around trying to ensure that everything was in place for the M2C challenge. THANK YOU for doing that, TAdams! One of the Mark2Curators joined the challenge as a personal challenge to raise awareness for dystonia on Rare Disease Day. Dystonia = loss of muscle control. There are many types, but you can imagine just how much more challenging that makes things! Read about her efforts here. And if you're curious how well she did--she made it to the top 5! I was worried about following StallCatchers because their task is so visually appealing while ours is text based and quite difficult. Indeed we got questions and suggestions-a-plenty about Mark2Cure on the StallCatchers forum, but there are plenty of very tenacious citizen scientists in stall catchers and they managed to climb pretty high in the ranks. The team behind StallCatchers is AMAZING!!!! Very generous with both support and humor! No wonder the StallCatchers are so ardent! If you think it's all over--think again! The Cochrane crowd of the challenge has just started, and CitSciMedBlitzers who participate in all THREE challenges will get a digital badge on their StallCatchers profile. It's an awesome badge! Now go take the cochrane challenge!